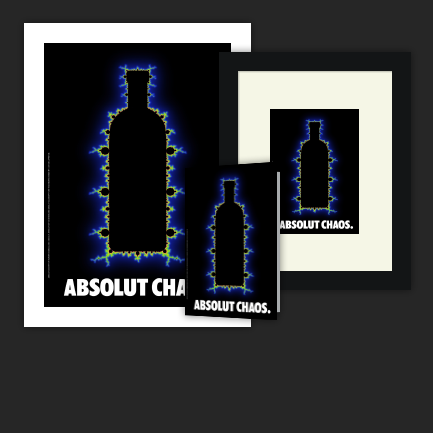 Absolut vodka design based on the Mandelbrot set. Professor John Barrow (cosmologist, theoretical physicist, and mathematician) used this image in his Michael Faraday Prize Lecture; Every Picture Tells a Story at the Royal Society in London in February 2009. Absolut Country Of Sweden Vodka & Logo, Absolut, Absolut Bottle Design and Absolut Calligraphy Are Trademarks Owned By V&S VIN & Spirit AB.